It’s a new year and for the hundreds of thousands of surfers who often base their social and work calendars on the tides, the first and most critical purchase they will make in 2012 is a tide calendar. 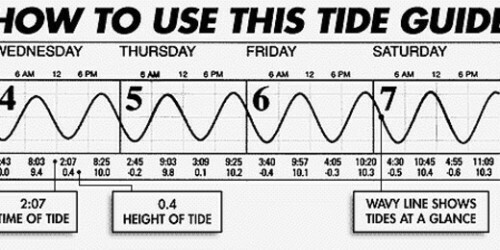 Most surfers will buy a Tidelines calendar, either in the form of a wall calendar or a pocket-size tide book, both of which feature the undulating ‘sine’ waves, graphically depicting the ebb and flow of each day’s tides. Encinitas local John Conover started Tidelines 30 years ago. The calendar is now sold in approximately 75 surf shops and over 1,000 retail outlets. Conover created Tidelines in 1981, driving up and down both East and West coasts, hitting up every surf and marine supply business. The grunt work has paid off. Nowadays, over 300,000 Tidelines wall calendars and mini Tidebooks are sold each year. With his success, Conover wanted to give back to the community. Within the last year, he introducedCalendarLink.org, a custom calendar that non-profits can easily create, using their own photos (or Tideline’s library of thousands of professionally-shot photos, featuring the likes of Surfer’s Journal photo editor Jeff Divine). Dozens of non-profits, both local and national, such as the California State Lifesaving Association,Rancho Coastal Humane Society, PETA, Smile Train and the Crohn’s and Colitis Foundation, have created and sold their own calendars on their unique custom webpage that CalendarLink provides on their site. “There are no start-up costs or printing costs involved,” says Conover from his office, which is caddy-corner to the downtown Encinitas fire station. “Non-profits make $10 for every calendar they sell and raise funds from the very first calendar sold since there are no upfront costs,” he adds. CalendarLink isn’t Conover’s first foray into community service. In 2009, he was one of three recipients of the Paul Ecke Community Hero Award, for his fundraising efforts with Encinitas Rotary and Hand in Hand Schools, an organization that forges ties between Palestinian and Israeli children. The popular ocean-advocacy non-profit Surfrider Foundation sells their calendars on CalendarLink as well. It was Conover’s idea to establish local Surfrider chapters and in 1990, he helped form the first chapter (San Diego). Conover served on Surfrider’s National Board during the organization’s infancy in the early ’90s. He and his partner in Tidelines, Encinitas resident Peter Curry, were instrumental in fundraising for sand replenishment projects at local beaches. The ‘ReSANDiego Project’ that Conover and Curry created, in 1997, helped secure $10 million in funding from SANDAG (San Diego County Association of Governments). With dozens of custom calendar competitors on the market, Tidelines has created a niche by allowing surfers, boaters, and other marine-photography lovers to create a custom calendar with tide information and sine waves from over 3,500 locations from Seattle to San Diego, to Maine, Maryland’s Chesapeake Bay, all the way down to Miami, and even Australia. Tidelines also allows for-profits and professional or budding photographers and artists to sell their own custom calendars. “You don’t have to be a surfer to enjoy or make your own Tidelines calendar,” says Curry, Conover’s business partner since 1990. “Anyone can make their own personal calendar and have important dates printed on the calendar, with or without the tides,” he adds. Tidelines has recently partnered with Surfer, Snowboarder, Bike, and Lowrider magazines to produce custom calendars for each respective publication. Despite the glut of do-it-yourself calendar companies, many of them much larger, Tidelines has managed to offer a unique product in the saturated calendar market while at the same time empowering non-profits. That’s something to be stoked about.